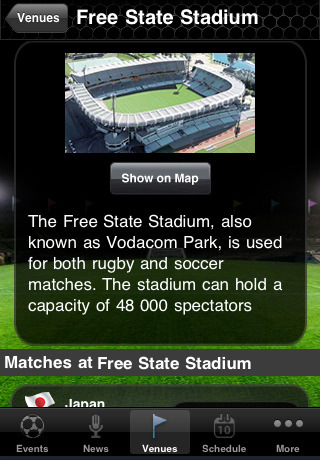 WC Soccer 2010 is an iPhone app developed by the South African company Webe Studios and is loaded with World Cup 2010 features and information great for anyone traveling to South Africa, or for fans around the world who don’t want to miss a moment of the action starting June 11th 2010. Using WCSoccer2010 Pro you get scores with game timers, news, details about all the teams and venues, schedules and score for the group and the knockout stages, and you’ll have the ability to track and monitor your favorite teams. WCSoccer2010 is an all inclusive WC 2010 reference iPhone app that has has clean sharp graphics, clear layout and some added features over the free ESPN 2010 World Cup iPhone app. The app is broken into 5 major tabs. The Events tab shows the current and up-coming matches, the teams, time and scores of the matches are displayed. The News tab shows the latest breaking news about the World Cup via an RSS feed. The Venues tab shows the different stadiums which will be hosting the World Cup. If you want a close glimpse at the stadiums there is a Google maps link that can be wonderful for getting directions while abroad. The Schedule tab displays all the matches, time, venue and more. The More tab has a lot of content hidden there which is actually pretty important and useful. From the More Tab you can get information about the Teams for each country with the groups they belong to, and tapping on each team displays a list of players its players and their corresponding positions. Unfortunately there isn’t any further bio or news regarding the players here, only their name and positions. Using the Groups menu here shows all the teams in each group (A-H) with their matches played, won, drawn, lost and the points earned by team. The Knockout screen shows a graphical layout of the teams from start to finish including the Quarter Finals, Semi Finals and Finals. Once the competition starts the Score section will list results and description of all the completed matches sorted by date or by group. Need to figure out how much those black market tickets are really costing you in South Africa? WCSoccer2010 has a built in Exchange converter that calculates amounts from many currencies to the South Africa Rand. Finally there are a few other useful tools here to help you make sense of all the madness including a customizable home screen with the tabs you love, video highlights of completed matches, and the obligatory countdown timer. Another great feature here which we can’t really test until the games begin is the live match timer that is designed to alert you about the status of Live matches during the games. AppSafari review of WCSoccer2010 was written by Joe Seifi on May 22nd, 2010 and categorized under App Store, Reference, Sports, Travel. Page viewed 4643 times, 2 so far today. Need help on using these apps? Please read the Help Page. Nice post!!! and great app, I’m using this app. Would love to see everything work for the Soccer World Cup. Great clear design aswell. Definitely recommend this app.